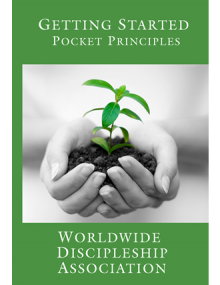 In Providing Follow-Up (Phase I-B), the disciple begins to grow spiritually: getting to know God personally and learning the most fundamental truths and practices of the Christian life. This material has been designed for new believers. Who is God? is a series of studies that examines the character of God and how to know Him personally. The guided discussions can be used with non-believers or believers in a small group or one-to-one. God’s Love, Mercy and Grace, Knowing for Sure. 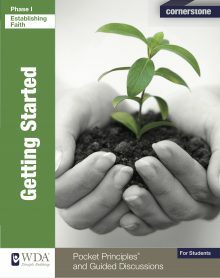 Getting Started, a workbook featuring Pocket Principles® and Guided Discussions helps the new believer begin to get established in his relationship with God. Topics include: How Can I Be Sure- Understanding Assurance of Salvation, Prescription for Doubters, Baptism- Going Public, The Holy Spirit- God Comes to Life in Us, The Bible- The Word of God, Prayer: Communicating with God, Fellowship of Believers- The Gathering of God’s People.